Cognitive science researcher Dr. Peter Jansen has developed a real, working, open-source tricorder. His Mark 2 Tricorder is powered by a lithium polymer battery; this amazing hand-held device can measure temperature, humidity, atmospheric pressure, magnetic fields, color, ambient light level, GPS location, and distance to a surface. "One of the most beautiful aspects of science is that while there is so much we can see and smell and feel around us, there's an inconceivably large universe around us full of things we can't directly observe. The Tricorder project aims to develop handheld devices that can sense a diverse array of phenomena that we can't normally see, and intuitively visualize them so we might see temperature or magnetism or pressure as naturally as we see colour. "The Tricorder project emphasizes accessibility. The devices we build are meant to be as inexpensive as possible, so folks might have access to them without having to worry about the cost, or their difficulty of use. My hope is that someday every household — and every child who wants one — might have access to a small device that can easily be kept close in a pocket or bag, and quickly pulled out when curiosity strikes. By turning a walk home through the park into a nature walk, and Dad's spring time home repairs into a lesson about heat flow, it's my hope that everyday experiences will become opportunities to learn and develop an intuitive understanding and deep fluency with the science of our everyday world." 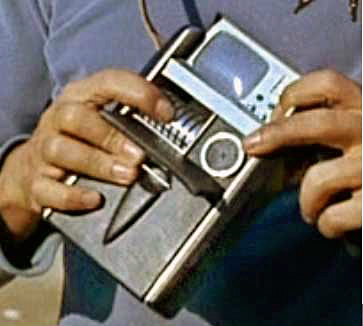 The standard Starfleet tricorder used by science officers from the original Star Trek series of the mid-1960's was used for determining various characteristics of landing areas (like life form readings). From Tricorder.org via Ars Technica; thanks to Winchell Chung (aka @nyrath) of Project Rho and Moira for contributing the tip on this story.